It all began simply enough. I wanted to live in the country, or the "sticks" as my friends call it. I began my search for a location that had everything I wanted and I found the small town of New Ipswich, NH. During that same search I luckily stumbled upon a secluded house that sat on a good sized lot of land. So I bought the house and started my life in the woods. Of course you can't live in the country without a dog, so I welcomed Crumbs, my Yellow Lab, to the family. Then came one of my yearly trips to Key West. Each morning I had breakfast at Blue Heaven, a local outdoor restaurant where chickens run free. Sitting there eating my blueberry pancakes I watched the chickens run beneath the tables amongst the legs of the patrons and it hit me. I needed to bring this atmosphere to my own home. I needed chickens. I went out and bought a couple of books on how to raise chickens and started doing just that. I soon became a very good Chicken Farmer and since the eggs were a huge hit with friends and family, I decided I needed to expand to a larger flock. I do not eat my chickens, so they live here as pets that pay their own room and board. With the success of my flock of chickens I expanded to turkeys. I raise and breed giant white broad breasted turkeys in a free range environment. The turkeys have become a bigger success than I ever could have imagined. 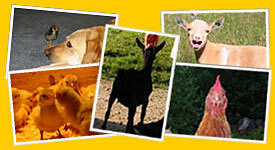 Many local families have a Has It All Farm Fresh Turkey on their table at Thanksgiving. Then came the question that changed it all - What’s next? A friend thought - how about some milk to go with the eggs? So I began my search for the perfect dairy animals. 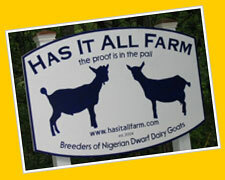 Along came the Nigerian Dwarf Dairy Goats. Their small size, personality and incredible ability to provide milk made them a welcome addition to the farm. As a bonus the wethers are like puppies and can climb and hike better than I ever could. It is this quality that makes them perfect companions when Crumbs and I go hiking. Not to mention they can carry gear so my pack becomes lighter. I started my herd with the purchase of three kids. A doeling; Nocturne, and two wethers; Smudge and SealsnCroft. I agreed to show the animals at least a couple of times, but at that point I was just concentrating on the milk and hiking with the wethers. The day finally did come and Nocturne and I stepped into the show ring for the very first time. I had no idea what I was doing, and felt terrible when the judge pulled me out of line with a couple of others. All I could think was, please don't put me in last place. It turned out that Nocturne was being compared to two Rosasharn doelings to see who would be placed in first. While others poked and prodded their does, Nocturne and I just stood their not knowing what to do. Turns out she finished third in our very first attempt. If I had done anything at all to help out, who knows what could have happened. Needless to say, at that point I was hooked. Since the very beginning, country life has always suited me and becoming a farmer was always a goal. My grandfather Kippy turned me on to it when he spoke of getting through the depression with the help of a set of chickens a neighboring farm gave him in exchange for some work he had done. He used to revel on how each morning he would go out and there would be eggs and how much that meant to him and his family. He got a huge thrill out of seeing my flock and eating the eggs. The best part of the farm is that I can never look around without seeing him there in one form or another. Kippy passed away in November 2003, but he did leave me with these lessons that have always stayed with me; stand by your friends no matter what the cost or the hardship and be there for your friends, no matter what you need to do to be there.